Speaking about flavored black teas I will touch upon only more or less traditional kinds — and completely exclude a huge amount of drinks with incredibly strong flavor. These drinks (abundantly presented by Bodum, Forsman, Nadin and other trade marks) can hardly be called tea — tea leaves are used there more like a basis which holds smells well, than like the source of its own taste and flavor. Experts call such drinks ‘colognes’ or ‘compotes’. By the way, the fact that I will not speak about ‘compotes’ does not mean that they are distasteful or low-quality. It’s just that this article is about tea. As well as many other tea things, flavored teas were first introduced in China. The Chinese flavored tea with chrysanthemums, roses, cinnamon-tree blossom, bitter orange, jasmine, and other things for two reasons. First, they wanted to get drinks with a new taste and flavor. Second, they wanted to add new gustatory and aromatic merits to tea of not very high quality — to sell it at a higher price. Often intersecting, these two reasons remain the same until nowadays. Jasmine Pouchong. Semi-fermented Taiwan tea. The most renowned Chinese ‘additive’ to tea is jasmine — and jasmine tea will be given proper consideration, of course. But — later. Because jasmine is usually added into green tea — and this article is devoted to black one. Nevertheless, speaking about black flavored teas, one cannot but touch upon Chinese tea tradition — almost all kinds of black flavored tea have Chinese origin. In our supermarkets there are several variants of vanilla: Newby Vanilla Classic, Twinings Vanilla Tea, etc. This variant is quite good, but is distinctly inferior to Sir Thomas Lipton Golden Vanilla. The latter is the kind with dried flowers in it — but I have not seen it for about five years. Almost forgot — you can add some sugar into vanilla tea — to combine sweet flavor with sweet taste. 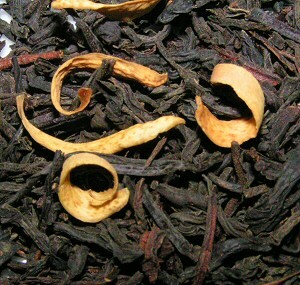 Whittard of Chelsea Orange Blossom tea. Tea flavored with orange, in spite of its obviousness, did not gain wide fame in Russia either. Of course, one can meet orange tea in our supermarkets, but, mostly, it is teabags with some chemical flavoring and smell, which can raise the dead. The exception is Sir Thomas Lipton Orange Jaïpur. This tea is flavored with orange peels and some other orange flavoring. Still it is not ideal. Orange Blossom Teas are ideal — orange blossom imparts subtle and lovely flavor, or rather — a hint of flavor. In England such tea is often called Windsor Blend and considered a special royal blend. Orange teas are quite multi-purpose — they are good in winter as well as in summer, with snacks as well as without them. Strongly flavored orange tea (e.g. Orange Jaïpur) has a universally pleasing taste — so, almost everyone likes it. Tea flavored with orange blossom is more subtle, and, like any other refined dainty, requires some prior training. 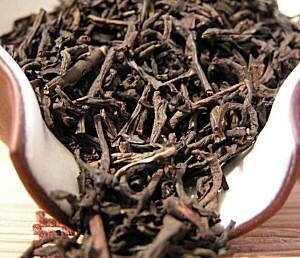 Lapsang Souchong may be already considered among famous flavored teas. Churchill’s favorite tea, tea mentioned in one of James Bond movies, and on the whole — a drink for real men, a specific drink with specific taste and flavor. Because on the last stage of tea processing (drying), this tea is smoked with pine sawdust (cones, needles — I have met different variants). The Chinese began to have tea smoked — very probable first time they did it smoked by accident, making haste to satisfy ever-growing European demand for black tea. But the British liked this ‘spoilt’ tea — thus, the Chinese started to smoke tea on purpose. In China this smoked tea is called Zhen Shan Xiao Zhong — theoretically, if let one’s imagination loose, one may find some consonance of the Chinese name with European Lapsang Souchong — especially since the etymology of the latter is unknown. 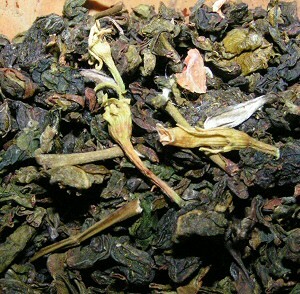 Zhen Shan Xiao Zhong — is a wonderful tea, with a very light — one may even say fine — smokiness. They say that a small amount of this tea is yearly ordered by the Royal Court of Great Britain. Maybe, Churchill drank this very tea. Lapsang Souchong, which is available for us now (under the trade marks of Twinings, Newby and Master Team), is rather heavily smoked. For want of habit, one can easily catch notes of turpentine, ski grease, and smoked fish. More sophisticated people find notes of fire smoke and prunes. In short — it is a matter of taste and habits. Whittard of Chelsea Alligator Lapsang Souchong Tea. By the way, cigarette smokers usually like Lapsang Souchong. It also has a ‘mega version’ — Tarry Lapsang Souchong. This one is smoked so much that when brewed it makes an ash-grey froth. Naturally, any variant of this tea is drunk without sugar — unless you are a lover of sweet turpentine. Earl Grey — is undoubtedly the most famous fragrant tea. The marketing legend that accompanies it usually tells a story of Charles Grey, a British diplomat, who, for his great services (or by wicked craftiness), was given a secret recipe of tea flavoring by a Chinese grandee (there are several other legends, but this one is the most wide-spread). Since then black tea flavored with bergamot oil has been called Earl Grey. Everything is very nice, but for one discrepancy. Bergamot does not grow in China. This citrus plant (do not confuse with a kind of pear-tree of the same name) has Italian origin. Thus, naturally, the Chinese could not possibly flavor tea with bergamot. Most likely, some Englishman, who was in China, (maybe, Charles Grey himself) tried there tea flavored with bitter orange (a traditional Chinese flavoring). Then either this man himself replaced orange by bergamot, or someone else did it — in brief, the replacement took place and immediately became overgrown with legends. For a long time, for example, a box with Earl Grey tea of R. Twining and Co Ltd. had an inscription that the tea was blended according to the Greys’ family recipe. Other companies wrote other stories — but they all were connected with the name of Charles Grey. In one case, he spilled (either accidentally or on purpose) bergamot oil on tea of poor quality, in another case, he schemed against Chinese tea supplies, because he had interest in Indian tea plantations — in a word, he managed to be everywhere. However, all these historical tea investigations are fine until they get boring — that’s why, enough history, let’s get back to tea. Probably everyone has tried tea with bergamot — so, it is unnecessary to speak about its taste and flavor. I’ll just point out some details. First of all, and this is true for all other flavored teas, bergamot flavoring should be mild and not suppress the flavor and taste of tea itself (Ahmad Earl Grey, for example, has too much of bergamot). Second, Earl Grey is a classical evening or afternoon tea. It is usually drunk without sugar, and with light snacks. Third, besides Earl Grey proper, there are several derivatives of this tea, where bergamot flavoring is not that strong — and these derivatives may be very nice (e.g. Ahmad Royal Blend). As well as other flavored teas, Earl Grey quickly palls — even if its first draught delights you immensely. Therefore I have not drunk Earl Grey properly for two years, maybe; hence, I cannot really evaluate those Earl Greys that are available in our shops. Two years ago I liked Twinings Earl Grey most of all. By the way, Twinings Company produces a ‘pair-tea’ for Earl Grey– Lady Grey Tea. Besides bergamot, it is flavored with lemon and orange peels and cornflower petals — which are almost unnoticeable in the brewed tea, but among dry tea-leaves they ‘blue’ very lovely. Anyway, Ladies of all ages like Twinings Lady Grey (and similar Sir Thomas Lipton Russian Earl Grey) — so, if you want to please your mother or impress a lady — go ahead, tea stands are waiting.